Trump Bashes Woodward: I'll Write The Real Book - Joe.My.God. 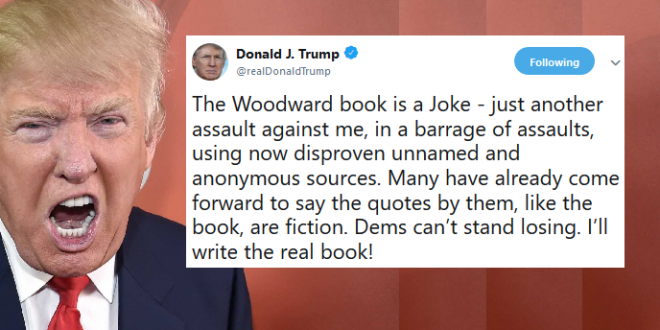 President Trump on Monday morning slammed veteran journalist Bob Woodward’s new book as “total joke,” vowing to write “real book” of his own. The White House has spent days pushing back on Woodward’s upcoming book, “Fear: Trump in the White House.” The president has claimed the Watergate journalist is an “idiot,” while White House press secretary Sarah Huckabee Sanders said the book is full of “fabricated” accounts.